Reading the topic heading no this is not an illegal immigration subject to begin with. It is about how immigrants of the past came here under the past laws that were in place vs the laws and skills and other requirements of today. Obviously we don't need to import many manual laborers today as we did in the past because our country is already built and our population has grown tremendously since then. Why don't some in here get that? Instead they imply discrimination against those types of immigrants today. IMO, this topic was started to try and justify illegal immigration today because it was supposedly much easier to migrate here in the past. I don't know where someone would get the idea that we "idolize" our ancesters just because most came here legally. What an odd remark to make. Under today's laws it appears that all one needs is to have a relative living here and your in. I think that the OP is trying to justify illegals breaking the laws because the USA like every other nation has some restrictions on immigration, however the USA has the very fewest. He thinks because millions can be sponsored as cheap wage IHOP workers that the system is very unfair. The past was quite different anyhow -- today the average person in the USA needs a college degree to support his or her family and it's quite easy for those with college degrees to immigrate, my immigrant co-workers are proof of that. There is no good reason at all to have massive immigration of those people who cannot make it here and cannot support themselves on very low wages. In fact immigration today is much easier because legal immigrants who don't make it end up on food stamps, Medicaid, all sorts of government handouts but in the past, you had to be quite rugged to make it here as an immigrant. There were no food stamps for the failures. There were no free health clinics, no free housing. Having babies here back then meant you worked to pay for them. There were no instant welfare handouts simply for giving birth here. Most immigrants today would not have made it here in the past. They're not tough enough to chop down forests to make farms and they couldn't last in the factories of the past where the working conditions were more difficult. They wouldn't have survived Indian raids. Here you go with your straw man again. You are NOT going to see employer-sponsored immigrants working at IHOP, collecting garbage, doing landscaping and construction work, being a bartender, or teaching elementary school. Any immigrants in these positions must have either been sponsored by a relative, or won the Diversity Visa lottery. Or they're non-immigrants working under a J-1 temporary visa. and a sliver of light in regards to your concerns of immigrating to the U.S. under todays immigration laws. So...in reality, and by your query specifically, it looks as if Family Reunification is the way to immigrating to the U.S. under todays immigration laws and becoming an American citizen. I am proud to say that...YES, I would qualify! Family reunification accounts for approximately two-thirds of legal immigration to the US every year. The number of foreign nationals who became legal permanent residents (LPRs) of the U.S. in 2009 as a result of family reunification (66%) exceeded those who became LPRs on the basis of employment skills (13%) and for humanitarian reasons (17%). 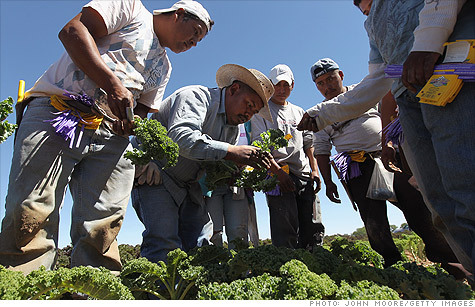 Immigrants, such as these farm laborers from Mexico working in Colorado, have gained jobs since the recession was declared ended last year. According to CNN, hundreds of thousands of immigrants have gained hundreds of thousands of jobs since the Great Recession supposedly ended, while American workers lost more than a million jobs. Last edited by HomeIsWhere...; 05-11-2013 at 10:25 AM.. Reason: Polish/Meican Farm workers photo added! Time to curb immigration based on family ruinification, IMO. Legal immigration needs to be mostly based on job skills that we need where no American can be found to do them with diversity factored in also. ...Most immigrants today would not have made it here in the past. They're not tough enough to chop down forests to make farms and they couldn't last in the factories of the past where the working conditions were more difficult. They wouldn't have survived Indian raids. Lionization of the immigrant ancestors continues. For all of their illustrious abilities to build a log cabin and kill a bear, they would not be allowed to immigrate to the United States. A college education doesn't give a natural ability of that either, you really aren't providing those critical details in your thread derailments. The question really isn't that complex, and it doesn't have any of the ethnic twists that are being attributed to it. It isn't generically asked about co-workers, if you were another gender, and/or pregnant with a child. 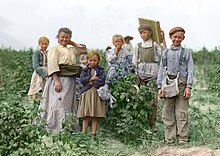 Would you and your ancestors, under the constraints applied on the topic, been able to immigrate to the United States under today's immigration laws? Uh; that has NOTHING to do with 2013. NONE of us were alive in 1492. Hell; the SAME could be said about later groups of American Indians too. Sheesh! If you really wanna push it: you gotta talk to Spain, France, England, Portugal, Holland and Russia. ALL of those places had parts of what are NOW the US before 1776. I think the question would be, would I want to immigrate to the US. To attempt to answer your question, I would assume I would be able to, however it is not up to me to allow me to immigrate, I can only apply to do so, the US would choose rather I could or not. Would your ancestors who came legally to the U.S. without breaking a single law (unlike the illegal immigrant scum of today), be able to immigrate to the U.S. under today's immigration law and immigration process? Assume that you and your ancestors are willing to wait in whatever line it takes and willing to fill out whatever forms and paperwork needed. Don't know, wasn't told much about my ancestors. From what I have found it doesn't give me much to go on either. They're not simple yes or no questions. ...you really aren't providing those critical details in your thread derailments. Are you the person that started the topic? Are you a moderator? Just who are you? The questions provided by the topic thread aren't very specific. They also show that the person originating the topic doesn't really understand the immigration process or the processes from years past. Definitely I would - as I work alongside quite a few immigrants who are here legally. Like I said, those of us who work in the same positions that many legal immigrants also work in, would have to have the same qualifications. So obviously I would be qualified to immigrate. I am at least as qualified to work in my job as are a number of legal immigrants. If they could come here legally, then certainly I should be able to also. None of my ancestors were IHOP employees which someone mentioned don't find it as easy to immigrate. Not one of my ancestors ever had to rely on Medicaid or food stamps. In fact immigration was tougher bac then because there were no safety net programs for immigrants who failed. It was all sink or swim for them. Back in earlier times, if an immigrant couldn't adapt, he or she would return home. Besides -- it is a rather odd question. My ancestors came legally so they were able to immigrate legally. They were not paupers, they had job skills that obviously were needed at the time. Legal immigrants like I said do meet certain qualifications but they are average qualifications in today's world. A college degree is nothing special -- but those without even a high school diploma cannot afford the high costs of living in this country today. Immigration laws should guarantee a kind of immigrant that is not going to be a government dependent. That pretty much requires an education and job skills.